The ultimate in Deck & Siding protection! 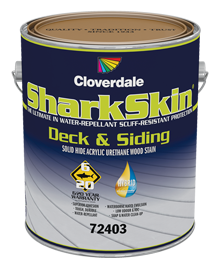 An exterior 100% acrylic solid hide stain developed with the industry’s latest hybrid waterborne alkyd technology that provides superior adhesion, durability and resistance to cracking, peeling, and blistering. Formulated with fewer volatile solvents and additional mold & mildew inhibitors compared to conventional solid hide stains.